- Richard Langston's poem, 3 June 2012 on National Radio. Living my days and nights in public, this blog feels rather like an idea I had yonks ago to even up the balance between people and animals, (to make it clear people are in many ways on an even keel with other life forms). I thought - if we keep animals in zoos, we should also have a human display. Build a house in the zoo, the entire front of it glass so the inhabitants can be clearly seen inside their 'cage', dining, lounging, cooking, working in a study or reading in their library, socialising when friends call in. Way before reality TV I dreamt this idea up and before the internet really took off. I imagined people would have to have bathroom and bedrooms private, but with some reality television scenarios that hasn't exactly happened so who knows what would pass in the human zoo, now? A human zoo exhibit appeared to me to be an excellent way to give actors work, too. Unlike animals in the zoo, these people would require payment of some kind and also, an ability to behave 'naturally' in front of an audience. The 'family' could change every three months or so. Now, countless people world-wide blog, skype, record youtube videos of every waking moment, allow reality TV shows to peer into their everyday and we see ourselves on screens world-wide, at times just living, but also somewhat often in situations deliberately set up to be contentious, difficult, strange or stressful. The zoo got bigger and did include us. It does. Anything where I have to problem-solve or figure out what's going on a great deal of the time, I'm attracted to. I love a challenge. Now I'm wrestling with the issue of adjusting to life back in this country, supposedly my home. But I loved travelling the Pacfic Ocean and the Yoo Ess Aye so much I now think I'd like to travel all the time. I can see why people sell their house and buy one of those campervans, then drive for the rest of their days across the country, or through many nations, a truly new view every morning, a road rolling on before them eternally. The road is life, always moving and changing. It would be so easy to do that. A woman who recently moved here says New Zealanders are hard, (polite and friendly on the surface but underneath we're tough and rather scary). In the culture-shocked state where I've been attempting to piece back some normalcy for weeks, slowly re-adjusting, I can see what she means, especially in Auckland and with some people, (those particularly hard or unforgiving towards anyone perceived as different to the majority). I hasten to say, most of my friends are not so combative or shielded, however a great many others certainly are that way, apparently. Their haughty disinterest and a kind of superior refusal to get too close to others, or a really sly, even cruel attitude where they want to take advantage of anyone seen as alone or vulnerable, comes about partly I think from years of struggling here, especially with the recent political hell inflicted upon us by the ignorant and greedy. Life in this city is nowadays rarely simple or lovely for the majority, so this hardness I notice around me is a survival mechanism at least in part, perhaps. My challenge then is to live with my grief and to stay here anyway in this rather hostile country, as I see it at present. Recently living in close proximity with so many people who were determined to get along and be kind, (the overwhelming atmosphere everywhere I went, while in five places across Am er ica from Hawaii, San Francisco, Seattle, Bettendorf in Iowa, Chicago then New York), then to suddenly arrive and live here again knowing about where I've just been and missing, loving the States, yet having to accept many people here will probably not be kind or co-operative, not now and not in future for some time, if ever? In these over-whelming, even terrifying situations I usually take stock of what's on my side. I build hope for myself. Enormous amounts of hope-building have gone on throughout my life out of necessity, (I grew up with a great many strange occurrences and some hurt me deeply), so I'm reasonably adept at this activity. Hope-building, if anyone would like to know, goes like this - list all the things known which are good and why, believe in everything written down on this list, completely. Take it all in like delicious food and drink, know the nutrition has obvious effects for the better. This is how to make life rewarding once more, even while it feels as if some kind of horror surgery is occurring, with almost all the goodness being extracted. It's combat, writing, at times. Family and stories, friends and absurdities, great food and glugs of wine, pathways into gardens and streams of water, morning skies and evening mist, fresh garden greens and home-made bread, grand books and arty movies, stupendous people and excellent paintings, mountains and crows, embroidery thread and glass beads, ephemera and black ink pens, pizza and beer, conversations in warm rooms and long lunches with wily coots, jazz and blues, violins and open air, roses climbing over an archway and tulips in the middle of the road, jokes and fires, mended and blended, hugs and kisses, airmail letters and postcards, trips to far lands and coming home. Wonder, inspiration and amusement, in complex ways my family affect and divert me. Stunning people like my children, talented and intelligent with excellent social skills. My mother's persuasive story-telling and sense of humour so inspiring, along with her determination to make the best of any situation. Blind for many of her latter years and always challenged health-wise, Mum could make herself cheerful almost all the time, in any situation. Those who've passed away who supported my writing and art without question, on my side and so loving I can feel their presence even now. My Aunty Helen's family had me read that poem, '...I have only slipped away into the next room...' at her funeral service. http://www.whenimdeadandgone.com/cgi-bin/index.pl?PGE_ID=22 Reassuring, even if I do miss her and my father, (her brother) terribly at times. They both gave me such courage and inspiration when others did not understand, they believed I'd succeed and told me so, their decency and intelligence are a part of me. I shall do my best and it shall be good no matter what. They're beside me, always and every time I celebrate another success it is partly their doing. Friends, for whom I feel so thankful I give them time and things constantly to prove it. People who can be counted on, (even if only to be themselves) who do support me, who aren't afraid to criticise or be truthful, and who aren't off and away at the first hint they could have to give something, (like a toss or a compliment, or a hand). No one's perfect, but those friends are perfect for me, as the Grace Jones song kind of goes, (ha). http://www.youtube.com/watch?v=uqZpPDc-k-M Extraordinary people I've also grown to know in the arts are a constant source of wonder, inspiration and pleasure. Stunning, intriguing, wise personalities and talents. Sometimes I feel like I wander a fantastic tale written by a grand master of literature, my artistic life's so demanding and delightful. Conversations or correspondence with those talented, generous people exercise my mind and emotions in thorough, startling and helpful ways. I learn inevitably from these fine associations. Sensual pleasures exist in abundance, too. Human beings need sensual pleasures for happiness, that's what we need the most of, some say. Clothes which feel good against my skin, and pleasure in wearing perfume and jewellery. Music and books and art and movies and dancing to refresh, invigorate and humble myself. Good, slow food, vegetables cooked carefully with herbs and natural flavourings, served with lovely wine and fresh water, a pleasure and life-affirming. My garden's abundantly green and flowery, birds constantly fly in, feed and perch, butterflies flutter about bright 'confetti' flowers by my window and feed on the pink, yellow and orange blooms' nectar, bees visit. This house smells good with incense and baking. It's only an hour or so to the Hauraki mineral hot springs at Miranda, one of my favourite places. Soak for hours, having driven through the lovely pastures of Clevedon, then wild bushland which leads to the gentle east coast, past glacial rock strewn beaches and the vari-coloured countryside with wildflowers, tussocky grasses and greenery reminiscent of Italy. Next whoosh by the bird sanctuary bordering a pale shell-strewn beach, to the steamy pools themselves. In some seasons, large grey herons flap in to perch on weeping willows in the grounds, and always more birds wheel and soar there than elsewhere. Rolling richly green hills border the hot pools and at night, the open countryside sky is often full of stars so I can lie on the water and spin slowly about like the heavens also, gazing into the deep blue scattered with sparkling points from too many light years away to ever count. Work which I love is rarely far away. Writing can be done after all with a stick in the ground if necessary. I can at times write my way out of or into many situations. This creative act has a magical quality, especially after practising rigorously for decades with some fine, extraordinary assistance from colleagues. I can write myself into feeling happier, or into a plan to see someone so I build confidence and well-being again, or into a world of imagination where I live through characters who play out scenarios, who teach me what I need to know, they reveal or develop mysteries. Poetry writing a glimpse of the divine and it feels like the most in touch I ever feel, apart from when making love, with the entire world of beingness, the universe and everything. My tutoring is also a joy. Many people who see the writerly life as attractive may attend classes or take up a pen, thinking there is a trick to it. I occasionally meet people who seem to believe they can write as well as someone who has done so for decades, may reach that standard with just following a few weeks' or months' writing course. The only way I know to be a good writer is to read far more than you ever write, and read well, while also writing an extraordinary amount, (much of which is discarded) then editing to the nth degree. (I agree with James George the novelist here, at least five edits of a novel are needed and I think this applies to any writing - essential. Yes, at least five. I rarely approach facebook like that however but I'm not claiming to be infallible). This blog took three days to write and about seven or eight edits, by the way, or maybe more (I stopped counting after five or six). Reiterating what I'm thankful for has given me a sore arm, (so I'm off to have a break and do some anti-OOS exercises) but I feel better now. Grief is a journey, and I'm a little further towards the place suggested to me by one of my fine friends, where it'll all be over and I'll be truly back here, readjusted, living at home once more and happy about it. All comments welcome and thanks for reading. 'So you were raised on soap operas,' he responded, flatly. 'I just wanted a drink.' He walked to the sideboard, opened a drawer. The wooden runners made a faint rubbing sound. He closed it again. His eyes went dark and she looked away. 'You'll make me something?' Her voice so high with disbelief she squeaked. For some reason then they looked at each other and held it, like some film director to the side of the room was telling them what to do for an effect. The story demanded this cliche, a frozen look of desire, then they could move on again, talking and walking around each other like half-wild creatures, looking for a way to be each alone and more sure of what could happen once more, wishing they didn't have to, wondering at the attraction they obviously shared. Elizabeth wanted him to repeat her nickname. She could be somebody else then. They could play-act ordinary until it turned real, couldn't they? He'd be Sam and she'd be Betty, they'd drink a cocktail at dusk then eat a delicious dinner, the table laid with blue and white china. Later, they'd lie in a bed tight as a drum with cotton sheets, then turn towards each other and kiss, skin on skin, the world falling apart with the bedclothes leaving only their passion to swim in and become, liquid. Made of fire and molten, they'd pour themselves into any shape they wished to cool together and change. He moved towards her and she closed her eyes when his breath felt warm against her cheek. 'Just win. Let's do that,' he whispered. She only needed to agree. 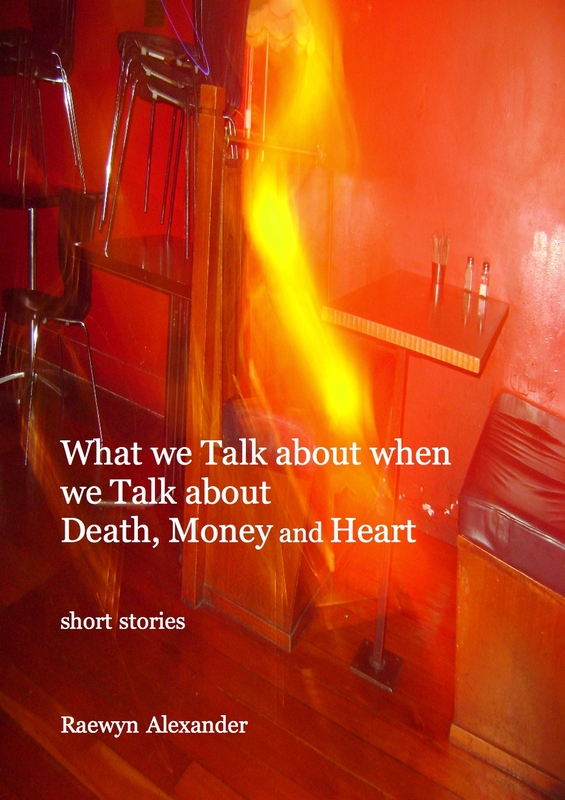 This collection of short stories and short short stories will be available in a week or so on Kindle as an ebook, (my first-ever).